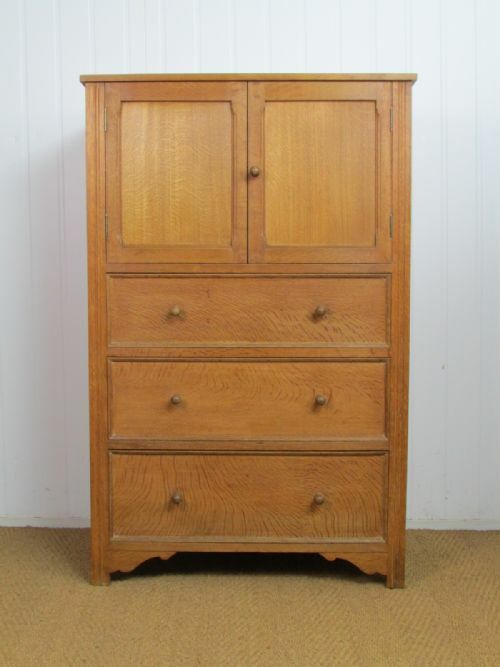 The cabinet: A limed oak cabinet over chest designed by Ambrose Heal c.1905 and made for Heal & Son sometime between 1906 - 1927. 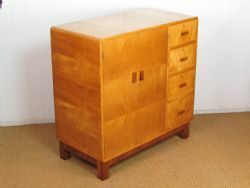 Iconically known as the Heal's 'Owl Cabinet'. 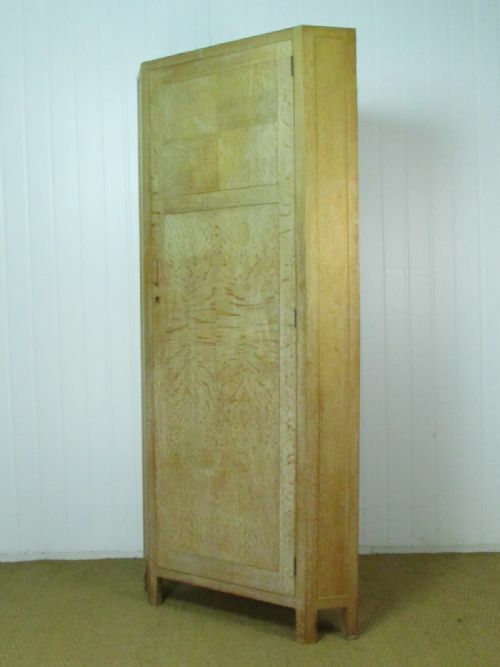 This particular example was one of only 5 made in a weathered oak (limed oak) finish. 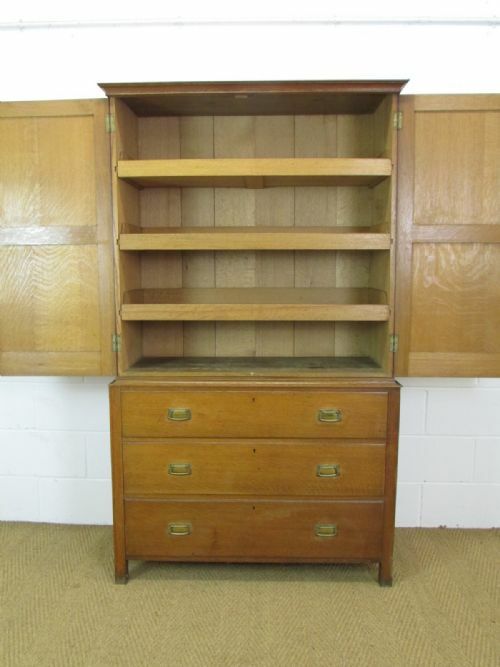 Condition: Offered in excellent original condition. 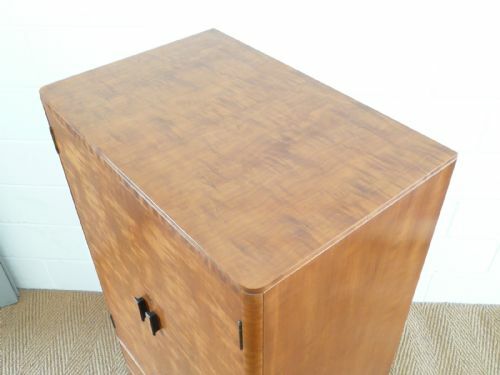 The finish has been simply cleaned and waxed - the liming is now very subtle. Please contact us for a detailed condition report and additional images. 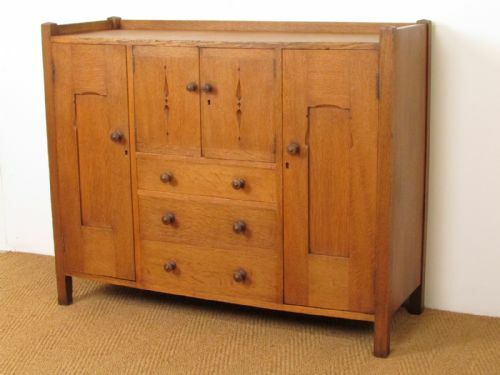 Dimensions: Width 44", Depth 21" & Height 60"
Arts & Crafts Cotswold School Oak Cupboard Over Chest / Linen Press by Gordon Russell. 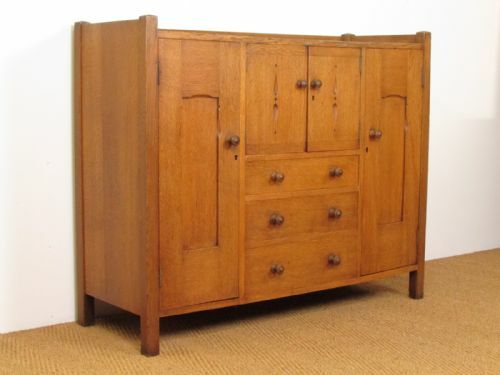 The cupboard: An Arts & Crafts Cotswold School cupboard over chest / linen press by Gordon Russell c.1925. 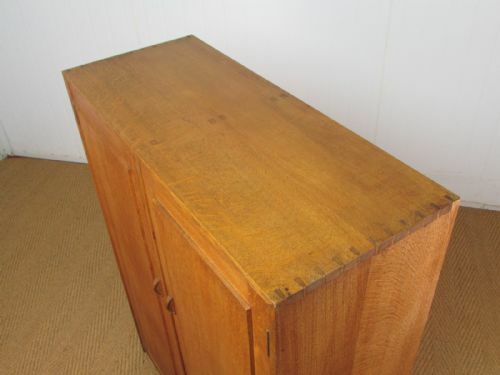 Labelled. 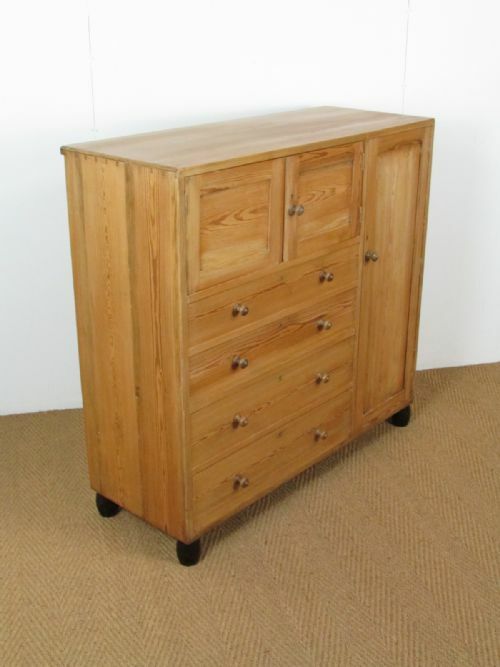 Constructed in well figured quarter sawn oak with contrasting bog oak handles. 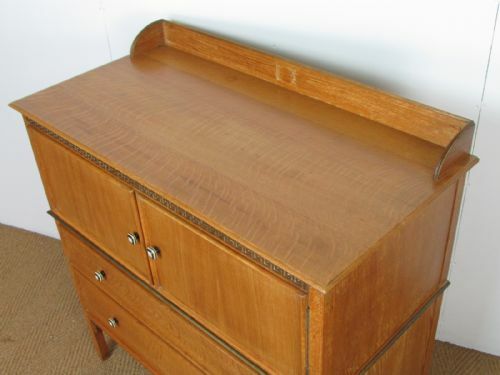 Condition: Offered in excellent original condition - simply cleaned and waxed. 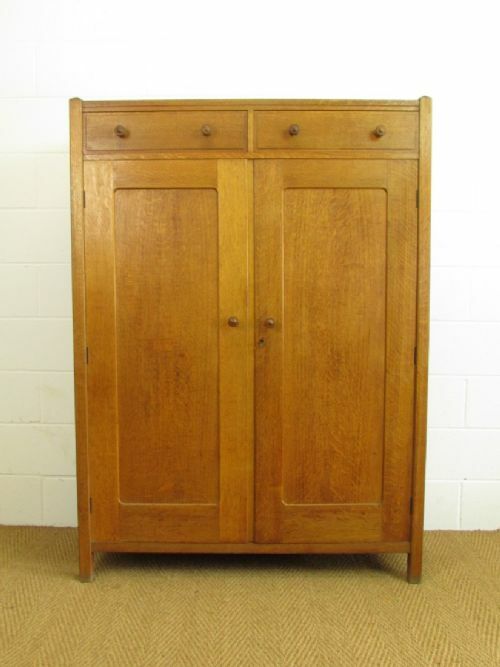 Dimensions: Width 39", Depth 22.5" & Height 67"
The Cupboard: A substantial Arts & Crafts oak linen press / housekeepers cupboard by Heal & Son c.1925. 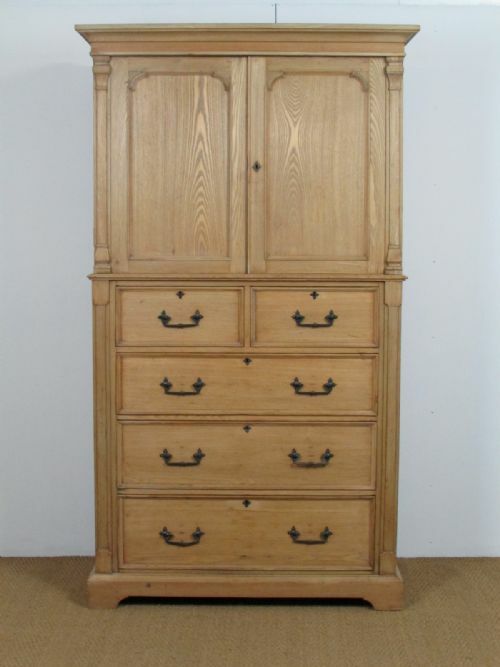 Labelled. 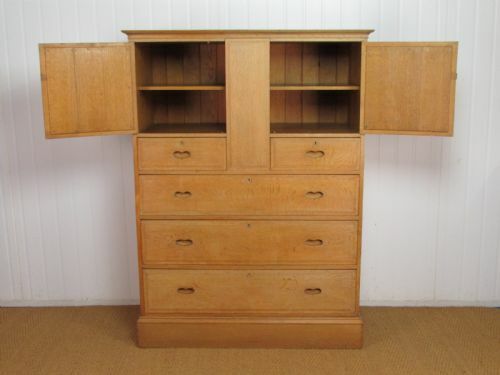 Two drawers over a two door shelved cupboard with 3 removable shelves. 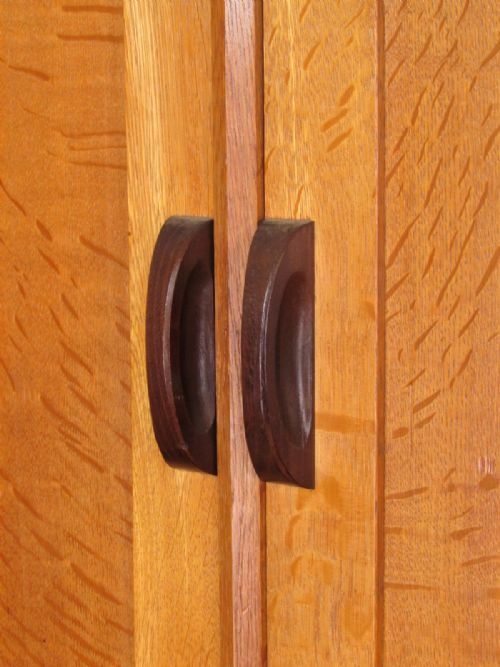 Original working lock and key. 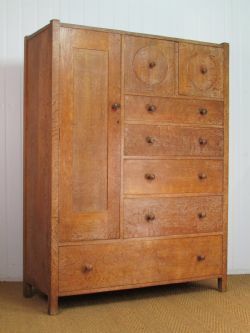 This is a very rare and significantly larger variant of a smaller linen press that Heal's produced throughout the 1920's. Dimensions: Height 66.5", width 48" & depth 18"
The cabinet: An English Art Deco / Modernist drinks cabinet / tallboy designed by Betty Joel and made at the Token Works plymouth 1931. 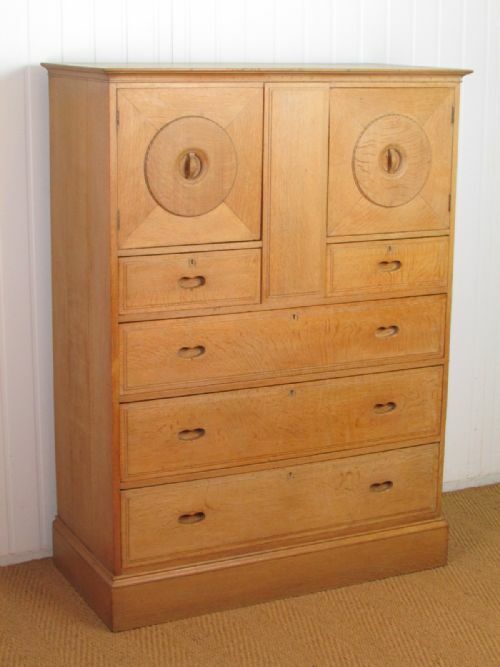 Labelled. 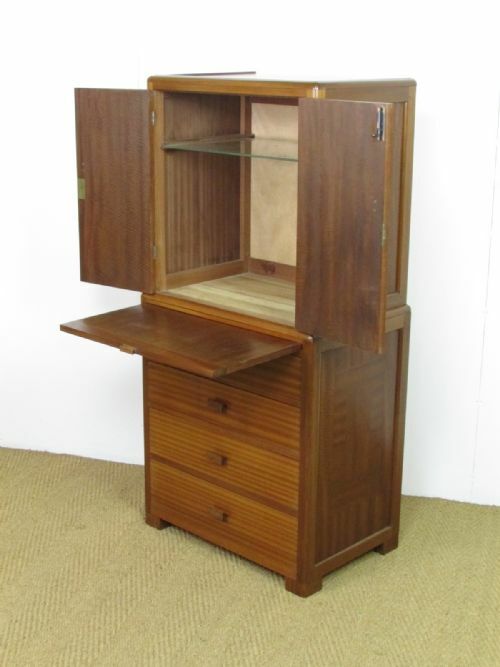 Constructed in well figured West African cherry mahogany with an inset glass top over a two door (drinks) cupboard with glass shelf, a slide and a bank of four drawers. 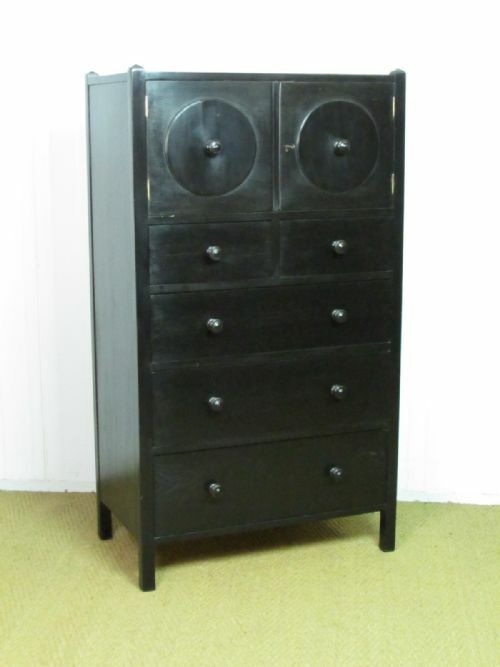 This piece does separate into two pieces for ease of movement. 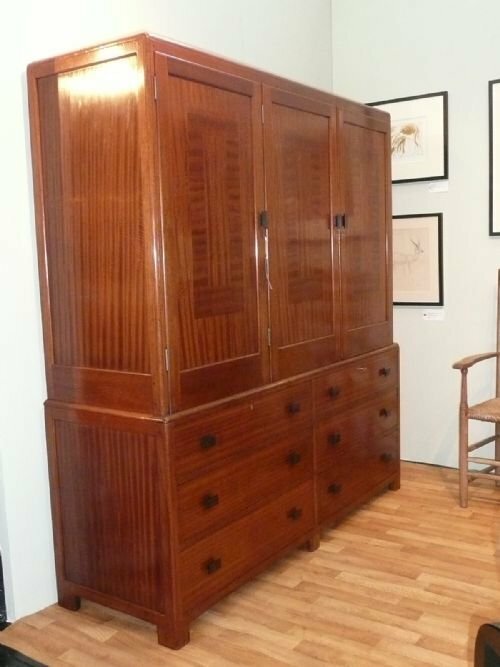 Dimensions: Width 26", depth 18" & height 56.5"
The cupboard: An Art Deco West African Cherry cupboard over chest of two drawers by Heal's dating 1939. 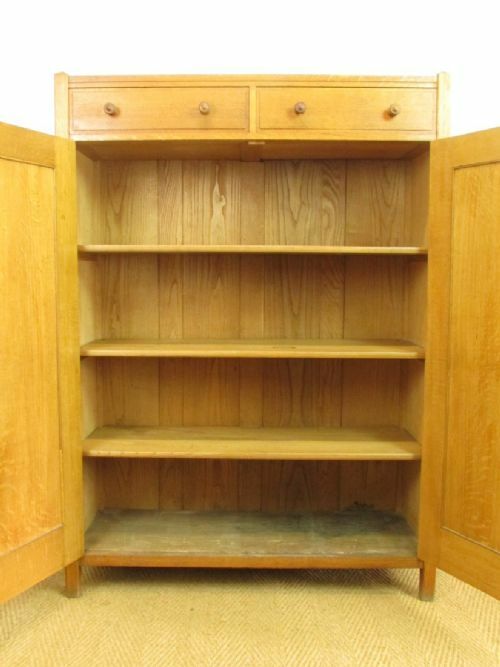 Two removable shelves to the interior (which could be replaced with a hanging rail). 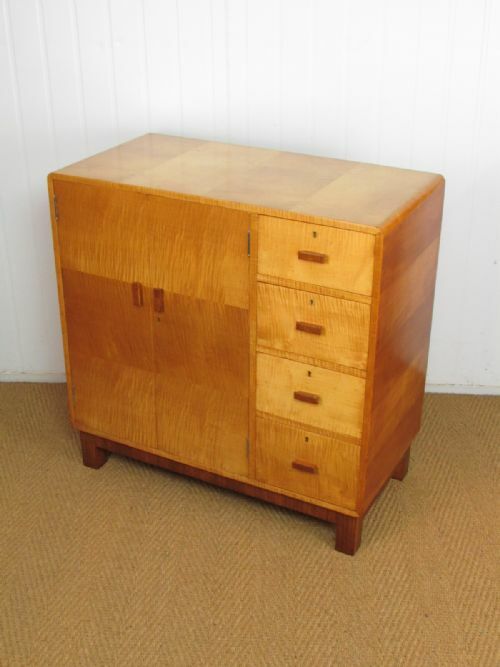 No label but we do have the original purchase order receipt from Heal's. 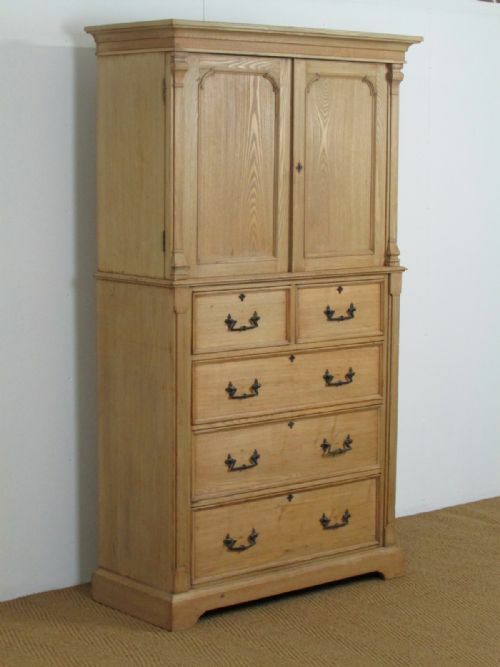 Dimensions: Height 57", width 30" and depth 20". 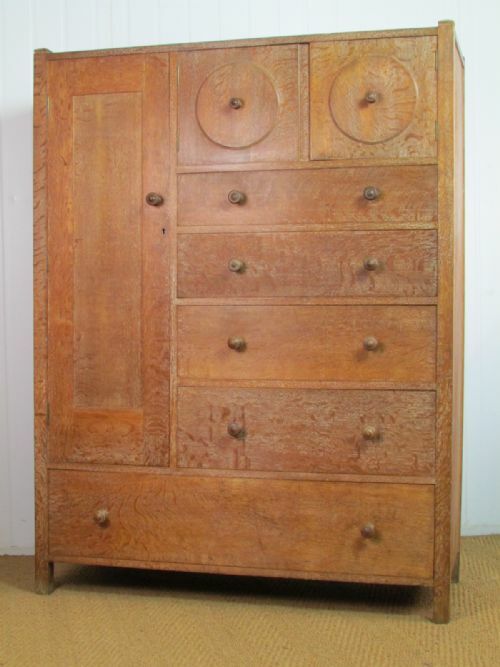 The press: A Gothic Revival ash linen press by the London firm Smee & Son c.1880. 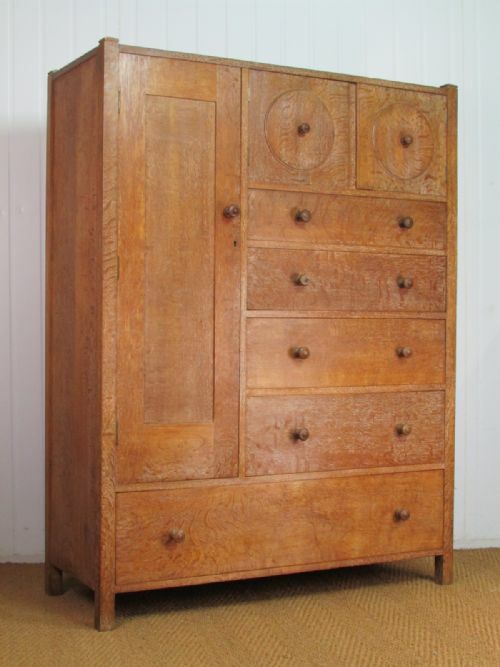 Labelled. 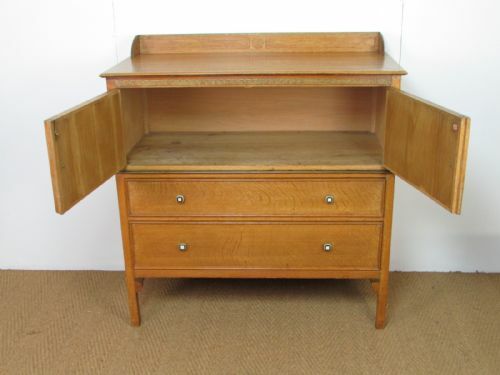 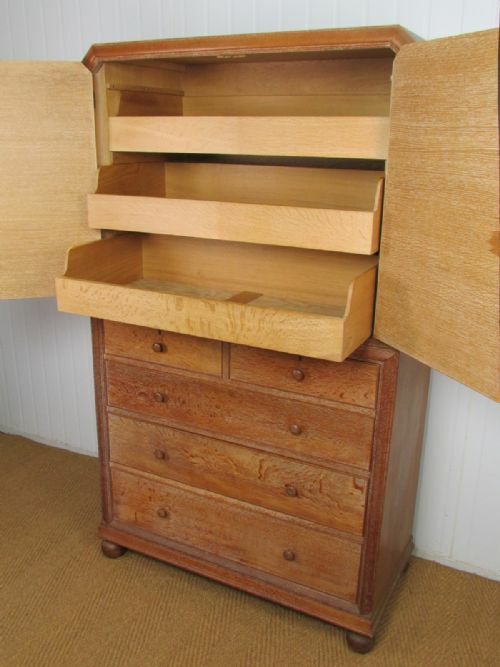 Small press cupboard with a single drawer slide above a chest of two over three drawers. 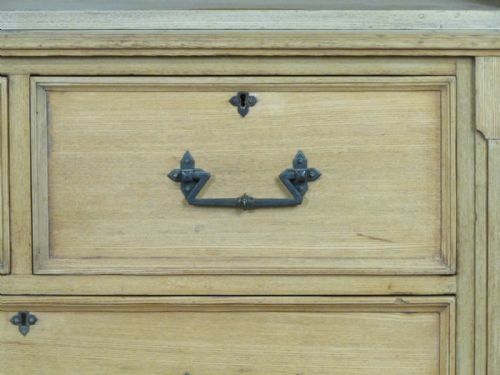 Unpolished with original metalware. 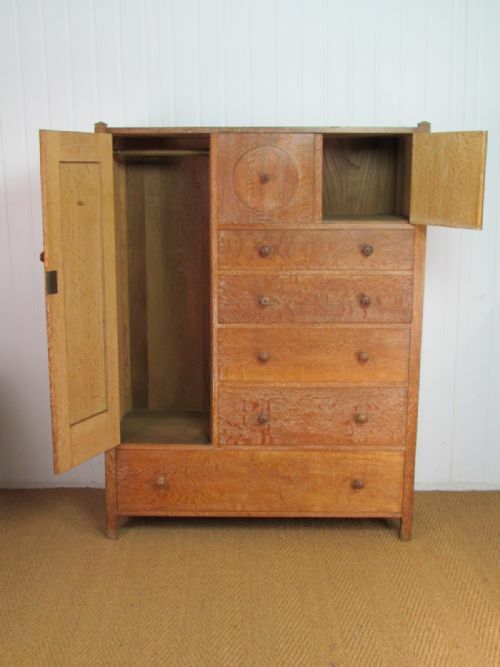 Condition: Offered in very good unpolished condition. Dimensions: Height 76", width 44" (maximum at cornice) and depth 18.5" (maximum at cornice). 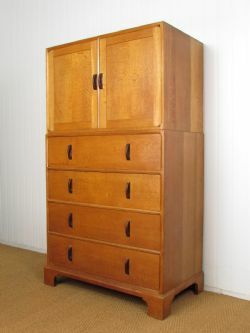 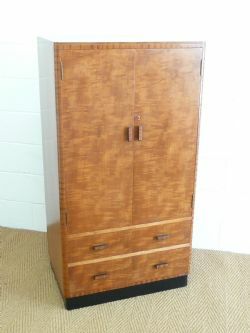 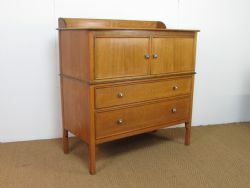 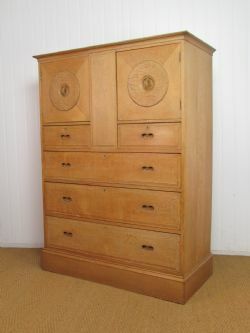 The tallboy: An English Art Deco oak tallboy / linen press / cupboard over two drawer chest by Bath Cabinet Makers c.1930. 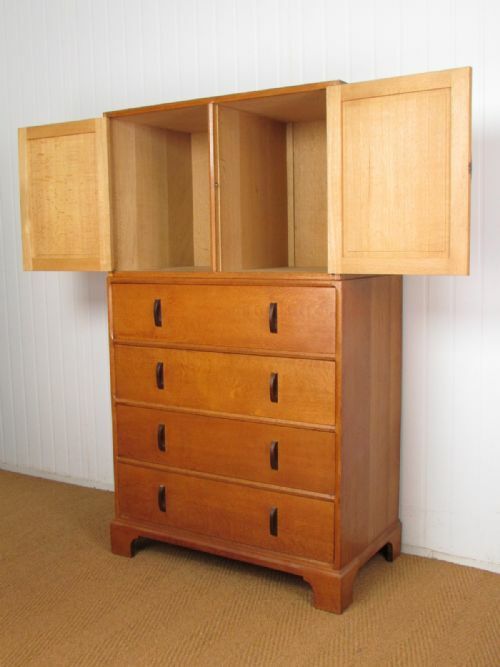 Labelled. 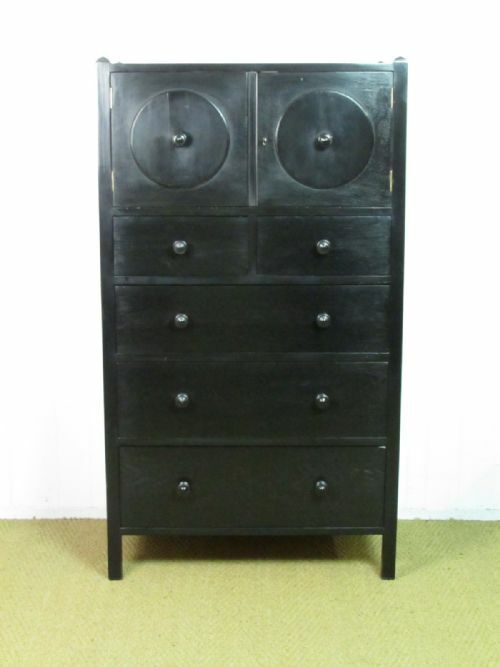 Original bone & ebony handles and subtle gilded detail. 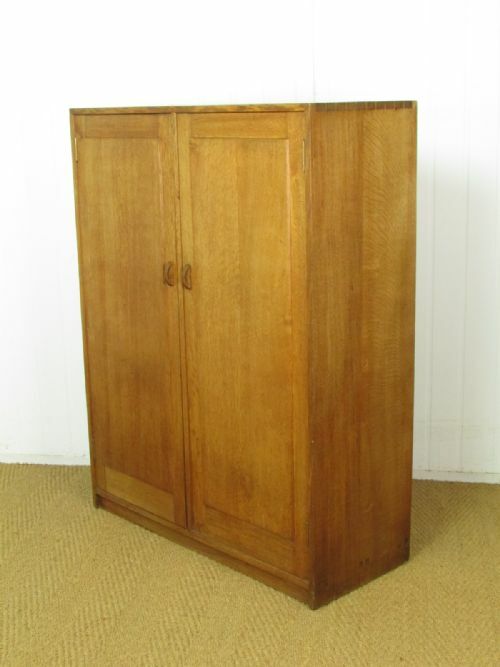 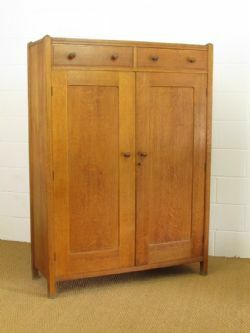 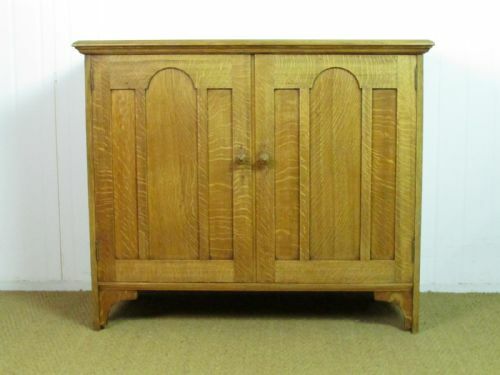 Dimensions: Width 42", depth 20.5" & height 43.5"
The Cupboard: A limed oak corner cupboard / hall robe by Heal's c.1930. 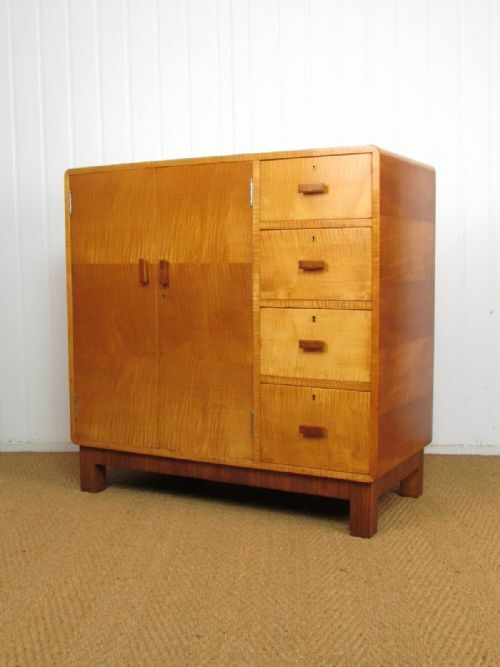 Labelled. 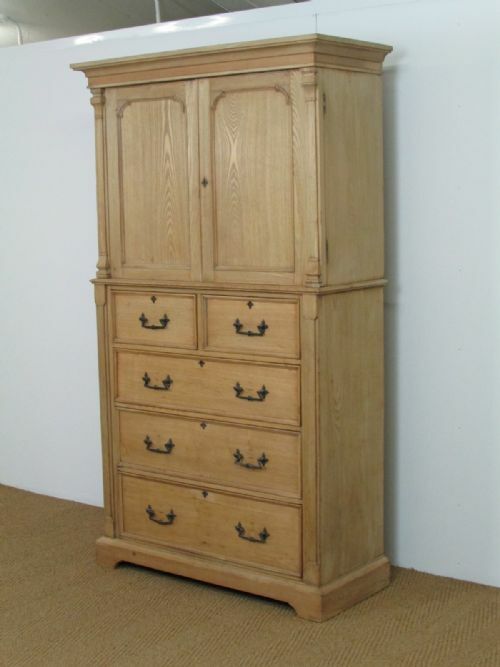 Constructed in well figured quarter sawn oak. 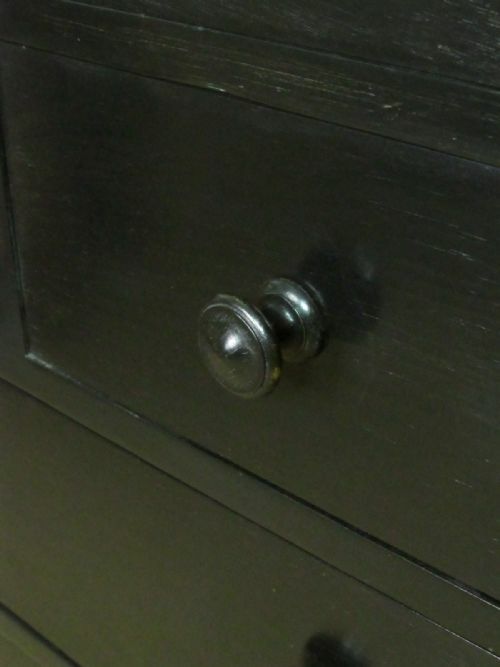 original working lock and key. 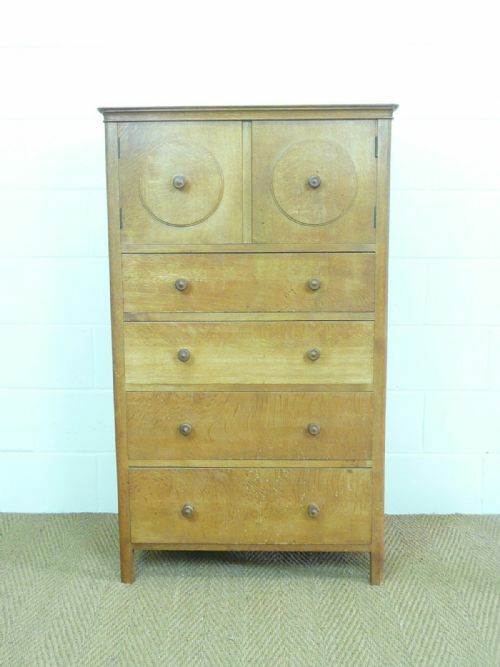 Condition: Shown prior to being cleaned and waxed. 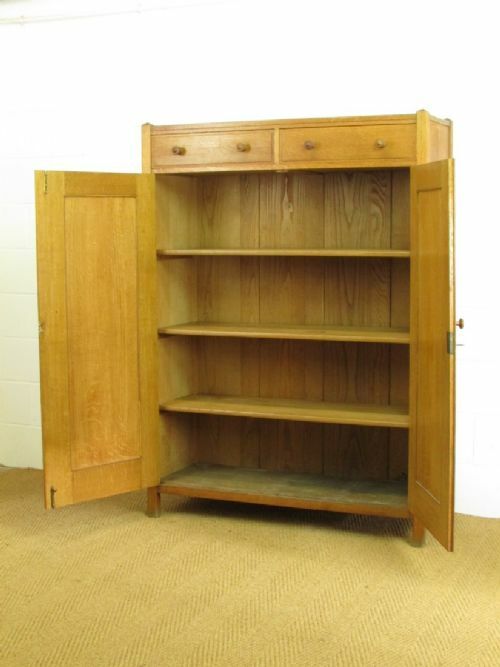 We can offer to have this pice fitted with shelves - please contact us for details and prices. 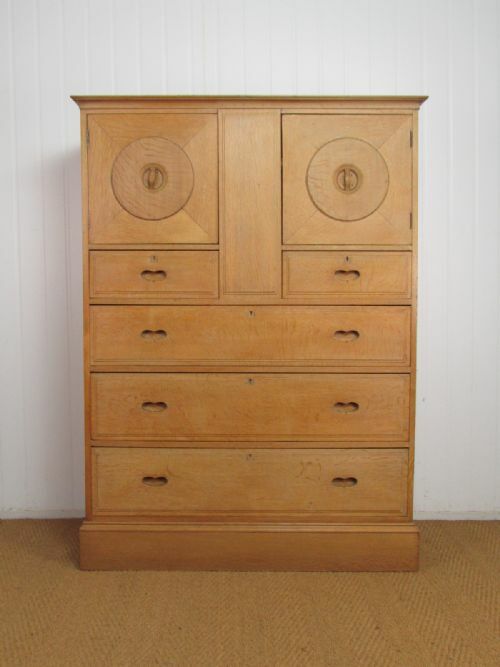 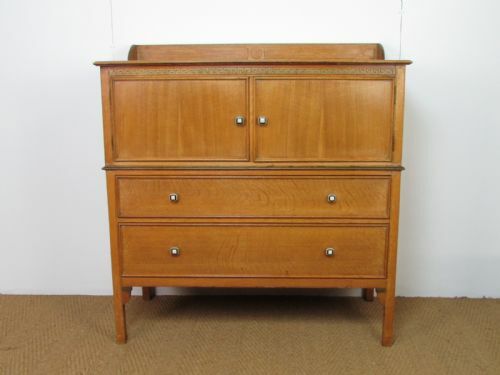 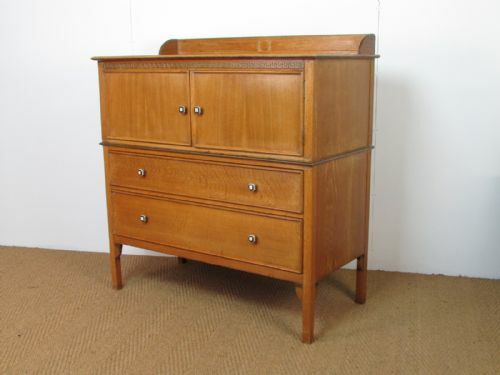 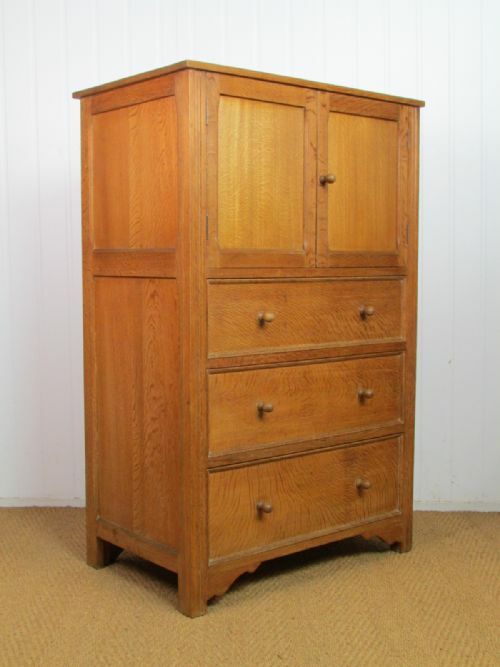 The tallboy: A Cotswold Style oak tallboy by Heal's c.1920. 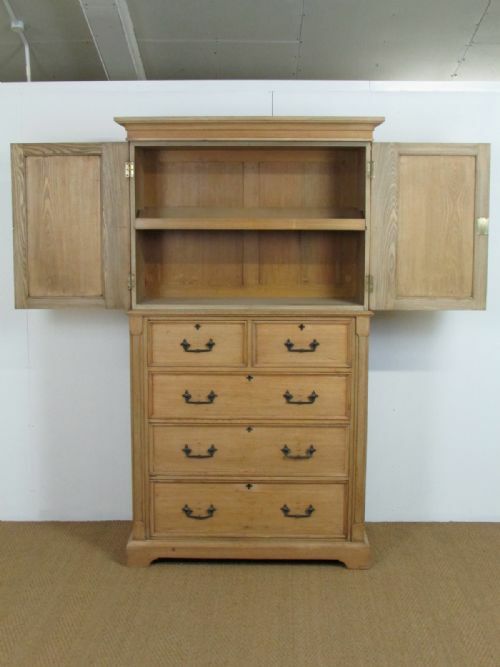 Finely constructed in well figured quarter sawn oak. Condition: Offered in very good original (cleaned & waxed) condition: some shadow marks to the top surface. 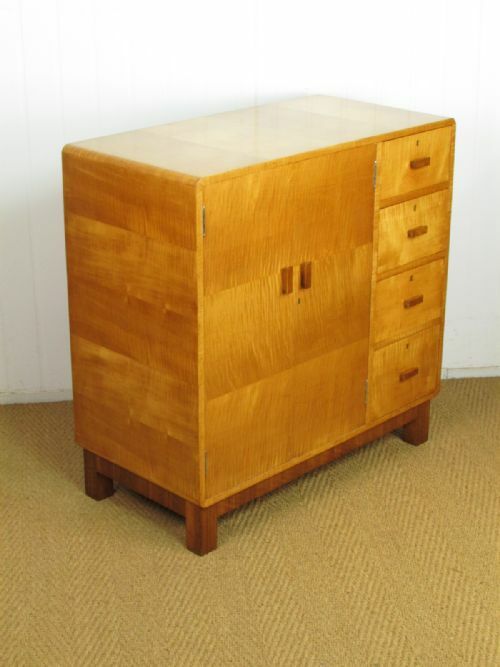 The cabinet: An Art Deco / Modernist sycamore side cabinet on a contrasting laurel wood base by Heal's c.1935. Labelled. 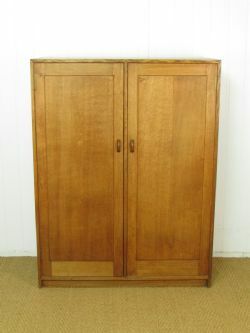 The cabinet has a double door shelved cupboard next to a bank of four drawers. 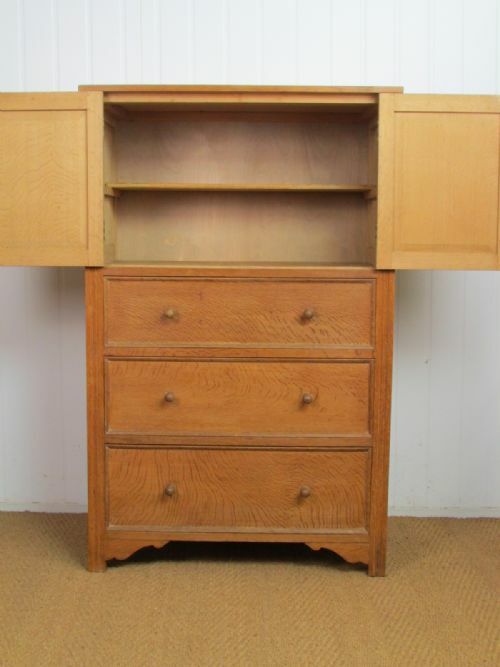 Condition: Offered in very good refinished condition. 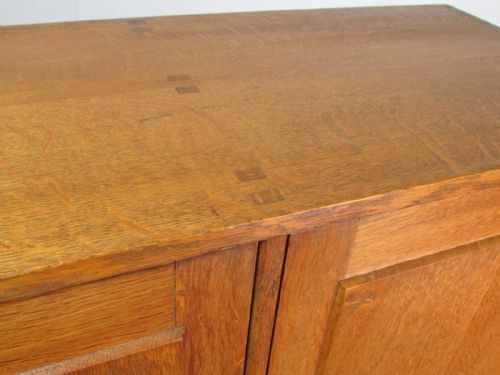 Some minor shadow marks remain. 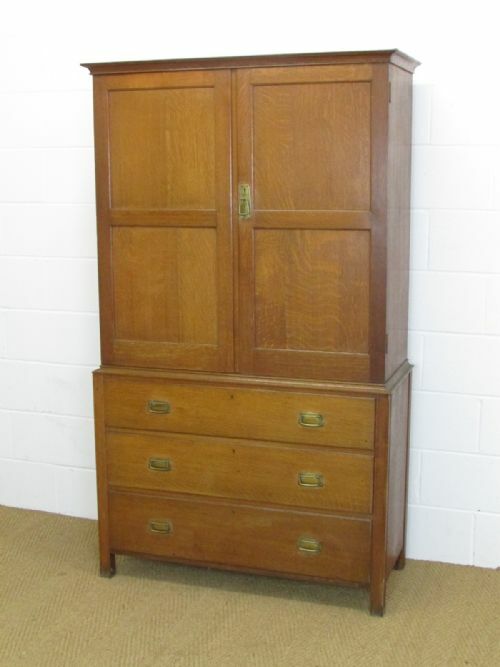 Dimensions: Width 36", Depth 18" & Height 36"
The Cupboard: A limed oak "Owl" cabinet over a five drawer chest and compactum wardrobe by Heal's c.1920. 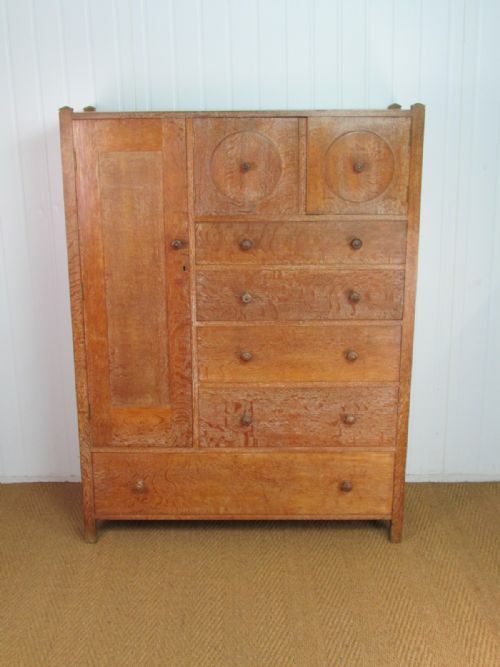 Condition: Offered inn very good original condition - cleaned & waxed. 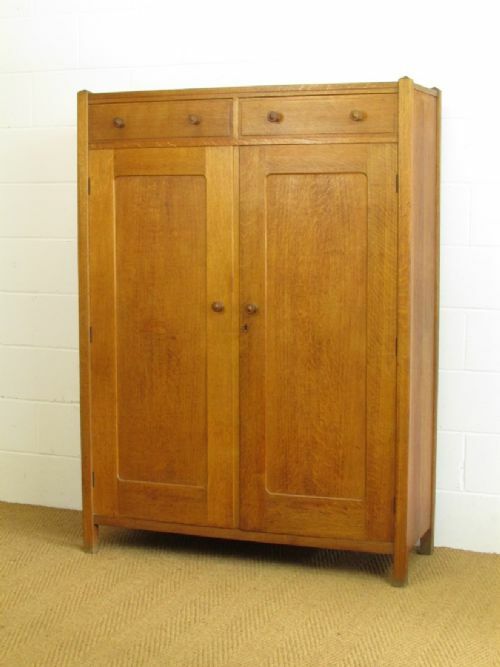 Dimensions: Height 60", Width 45" and Depth 19"
The cupboard: A substantial limed oak linen press by Heal's c.1930. 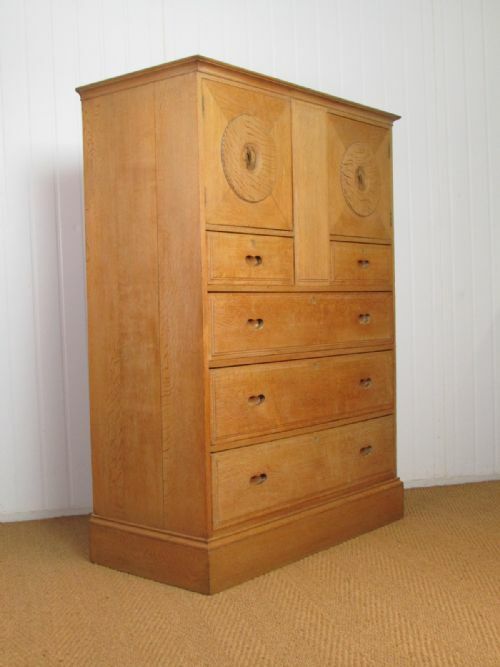 Constructed in well figured quarter sawn oak with a press cupboard with 3 internal drawer slides over a chest arrangement of 2 over 3 drawers. 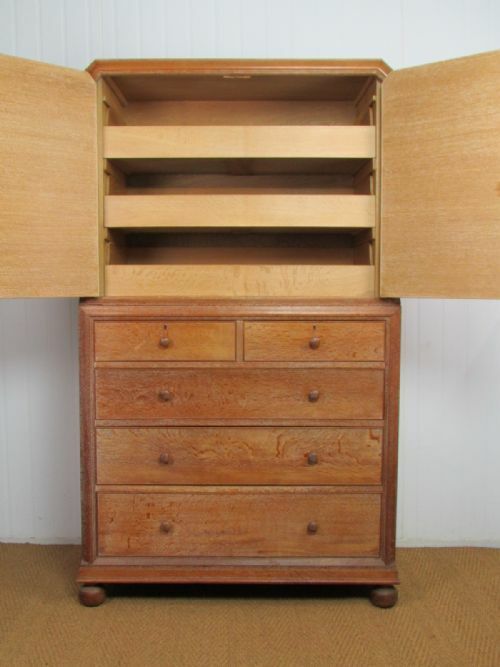 Label to drawer. 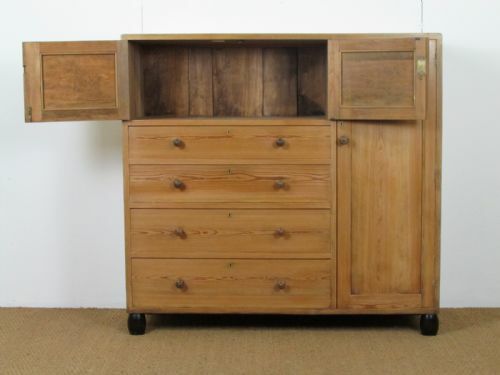 This piece can be separated into 2 for ease of movement. 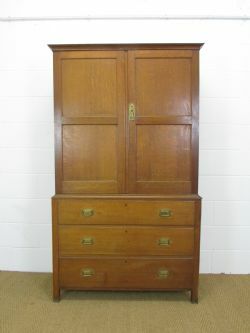 Condition: Offered in very good clean and original condition with working locks and a key. 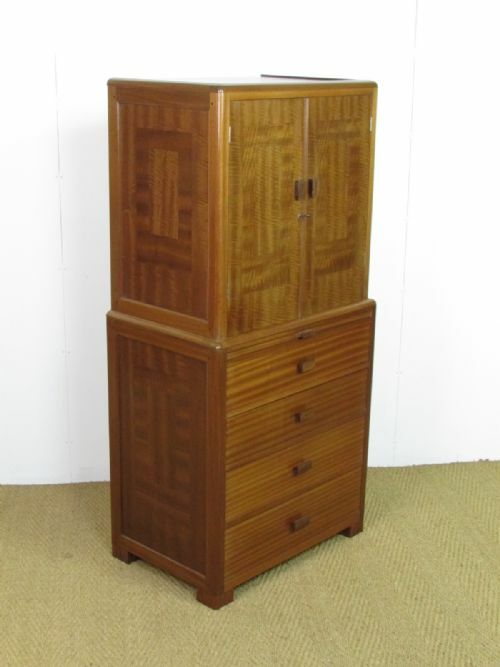 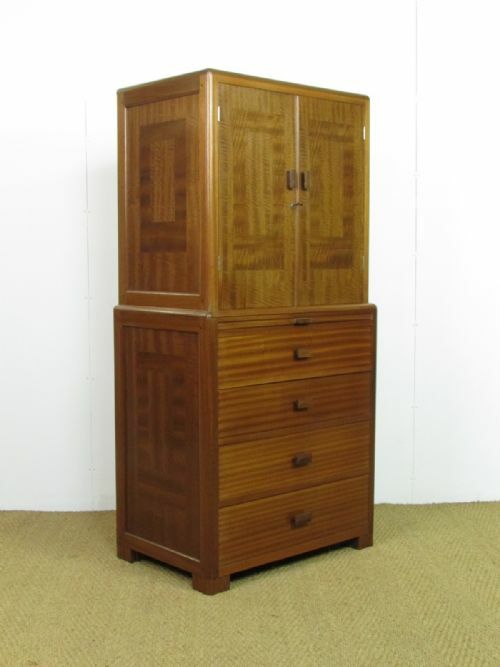 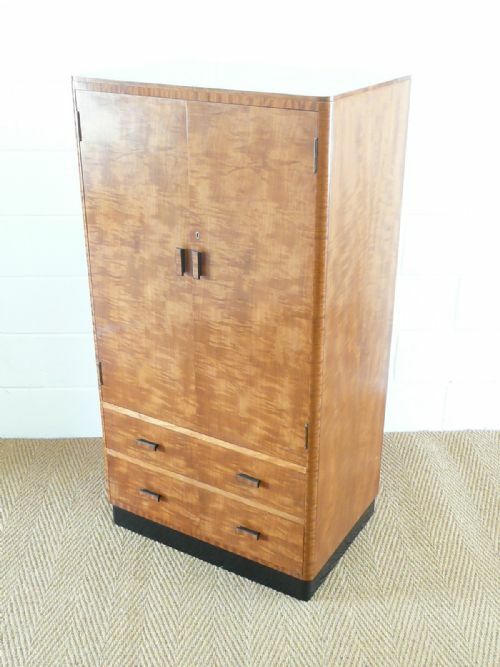 Dimensions: Width 42", Depth 21" & Height 72"
The cupboard: A Modernist / Art Deco cupboard over chest / linen press designed by Betty Joel and made at the Token Works dated 1930. 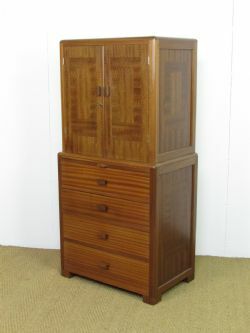 Constructed in well figured exotic hardwoods with contrasting rosewood handles. 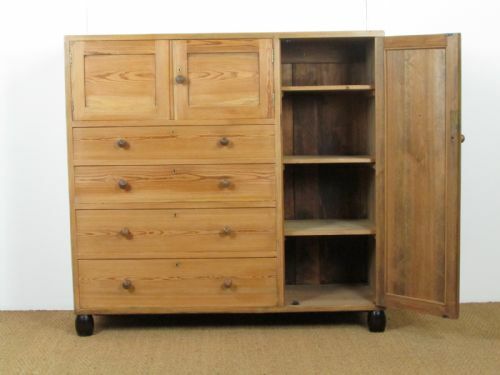 There are three seperate cupboards with each with two adjustable shelves over two banks of three drawers (six drawers total) all with contrasting rosewood handles. 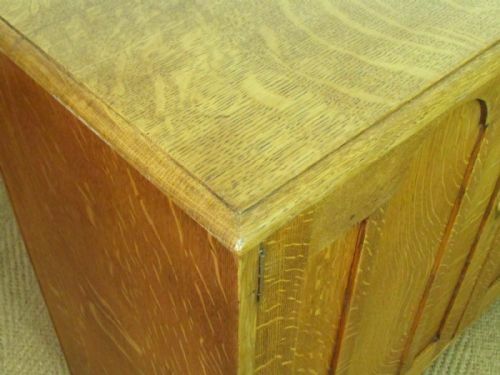 Label to rear. 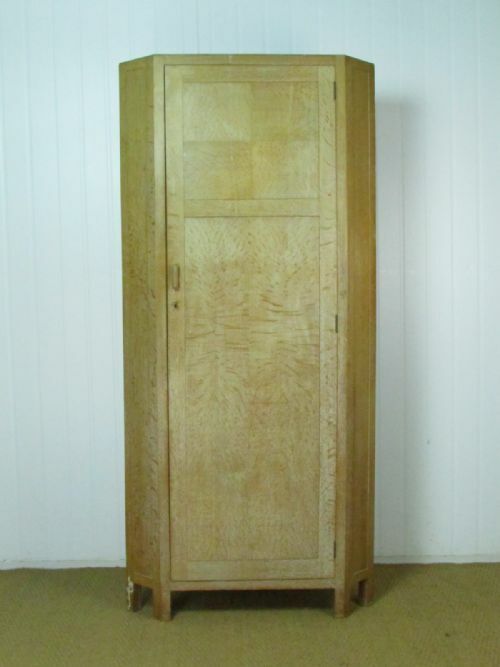 Dimensions: Height 75", width 71" and depth 22.5". 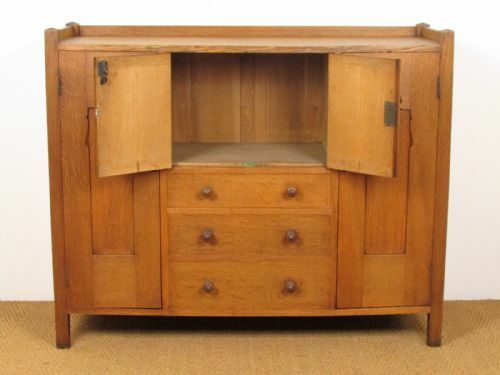 The Cupboard: An Arts & Crafts oak compactum designed by Ambrose Heal for Heal & Sons c.1910. 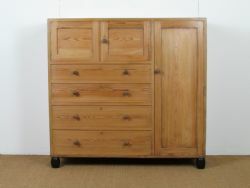 Central two door cabinet over three drawers flanked by either side by a full height cupboard. 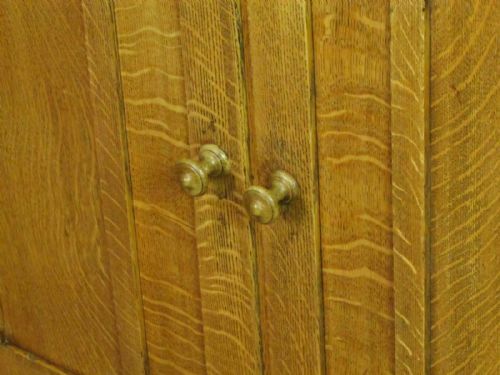 Labelled. 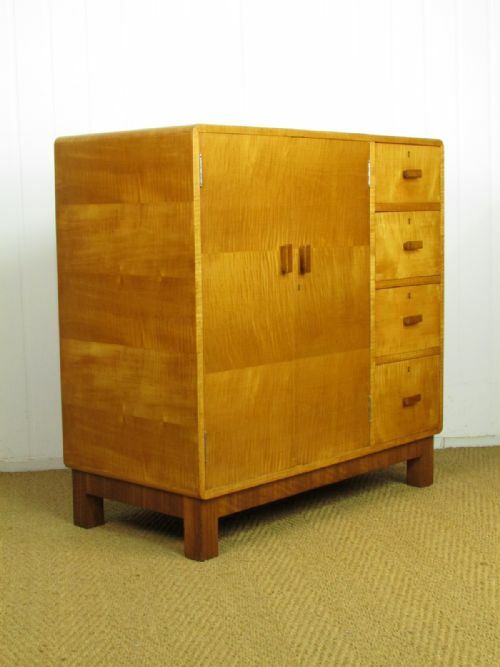 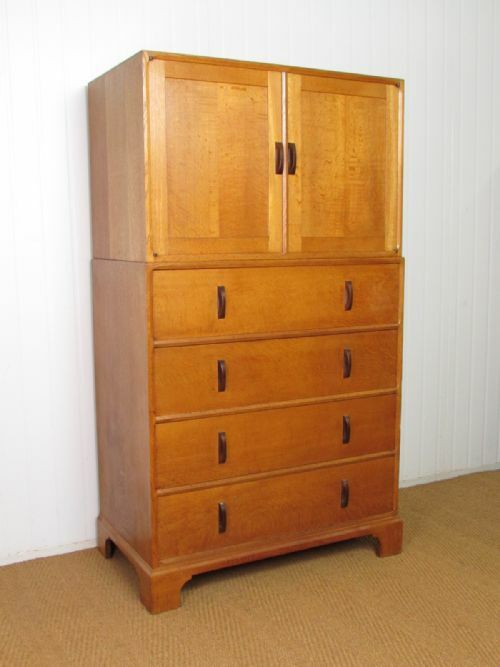 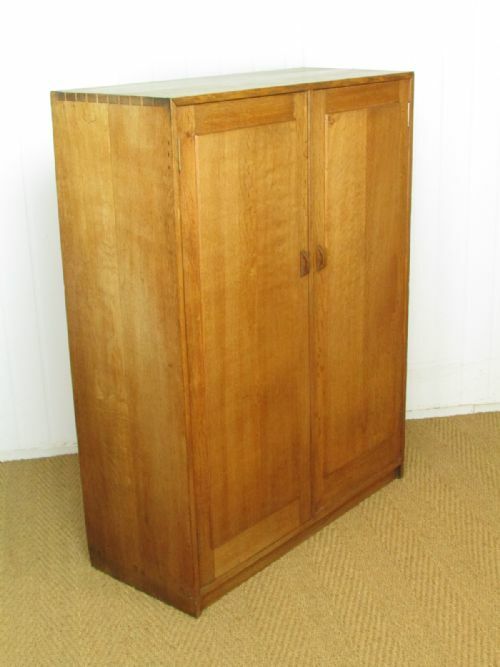 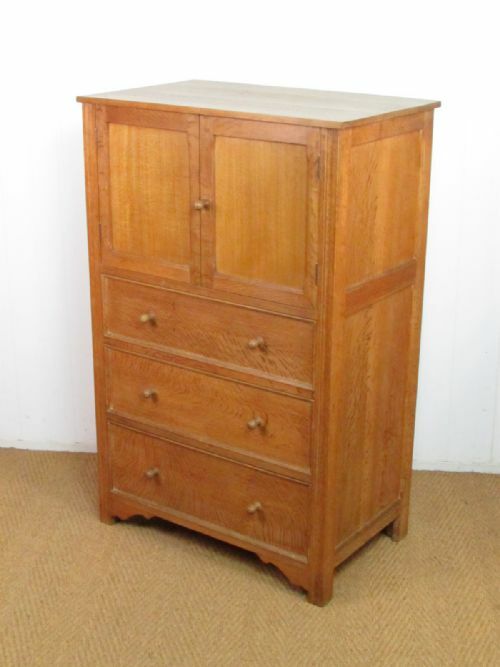 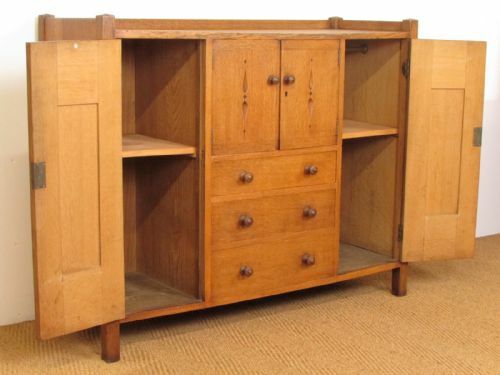 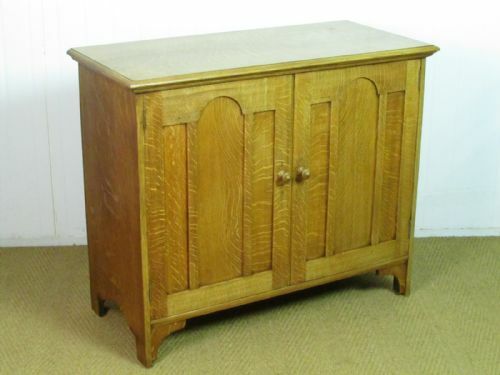 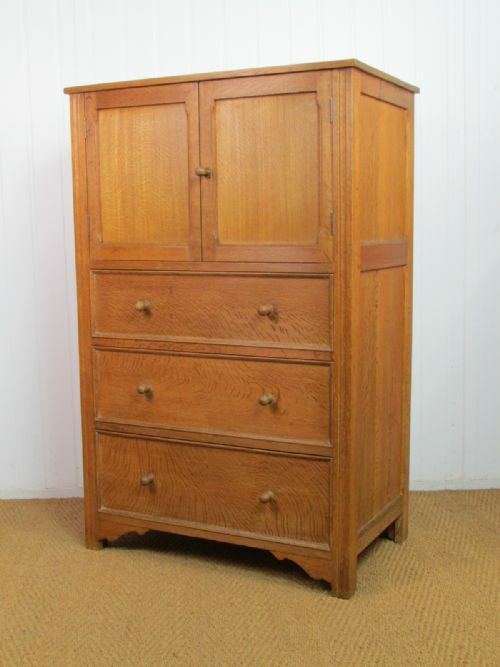 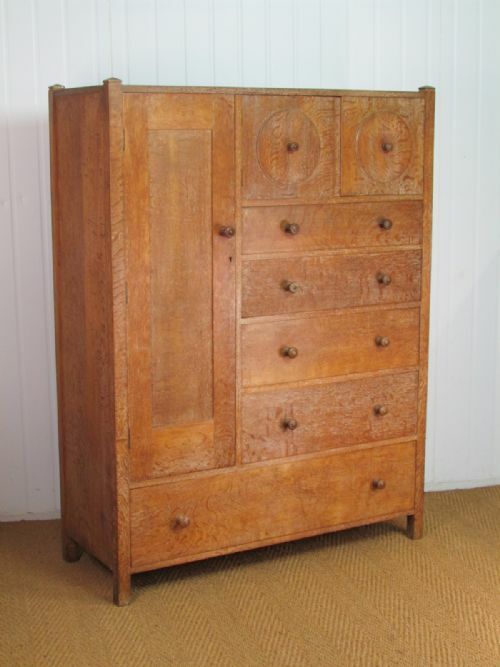 The Linen Press: An Arts & Crafts oak linen press designed by Ambrose Heal for Heal & Son c.1904. 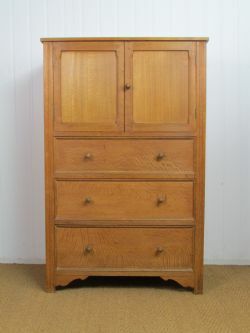 The cabinet: An oak "owl" tallboy cabinet over chest of four drawers designed by Ambrose Heal and made by Heal & Son c.1915. 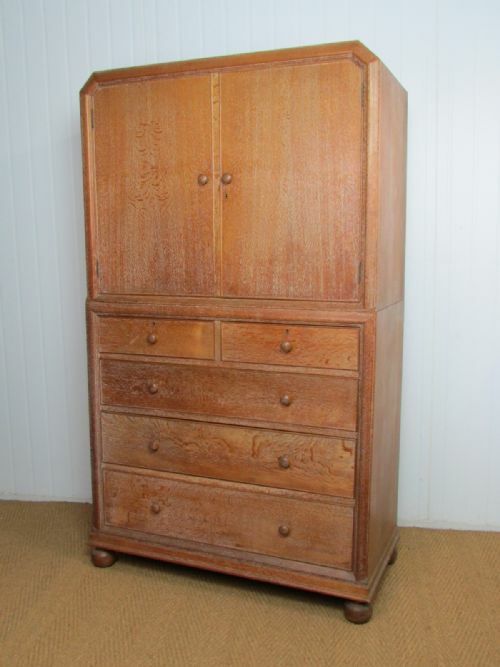 Labelled. 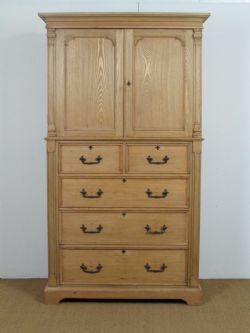 Constructed in well figured quarter sawn oak. 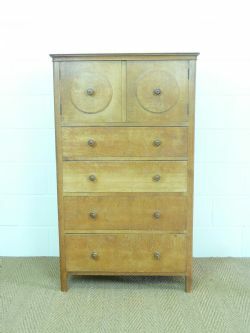 Condition: Shown prior to being refinished. 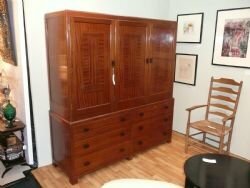 To be offered in excellent refinished condition. Dimensions: Height 52.5", Width 31.5" and Depth 19.5". 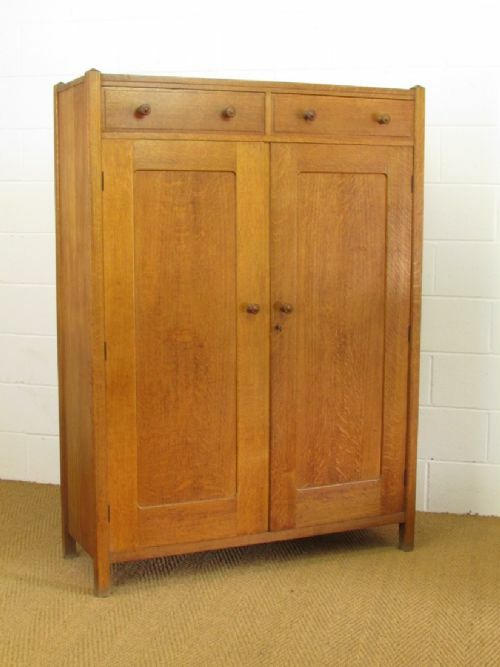 The Cupboard: An Arts & Crafts Cotswold School oak cupboard after Peter Waals, made by handicraft students under the direction of Edward Barnsley during the late 1930s. 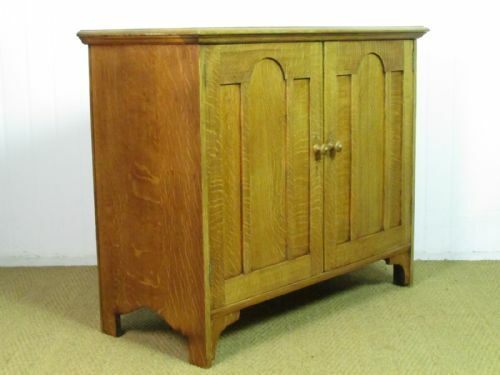 This piece is unusual for such pieces being constructed in well figured quarter sawn oak and was probably made for the college office or library. 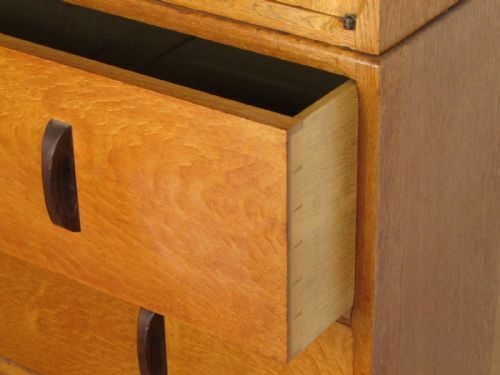 There is a clear influence from Peter Waals evident, whose designs were used by students, with the handles, raised panels, through tenons and dovetailed joints. 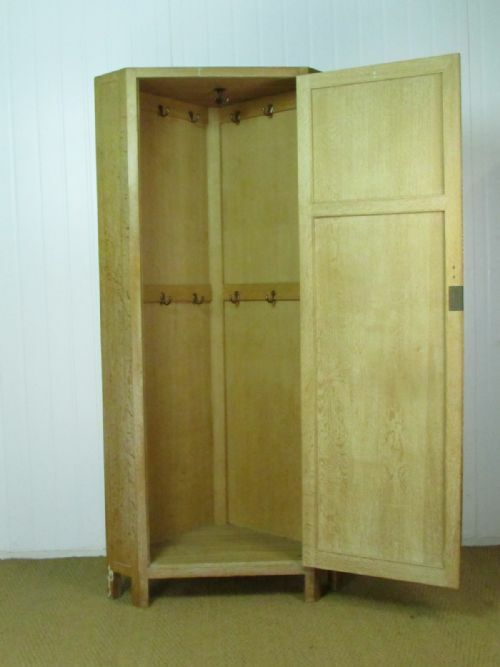 The whole cupboard sits on hidden castors which can be removed if preferred. 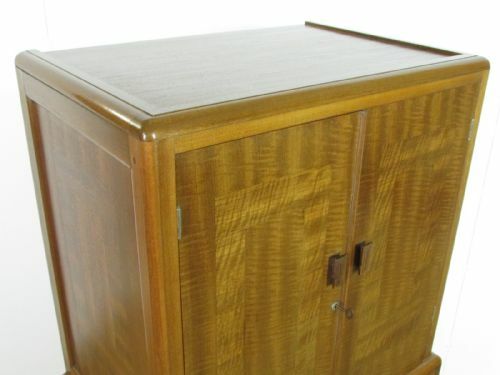 The back is fibreboard. 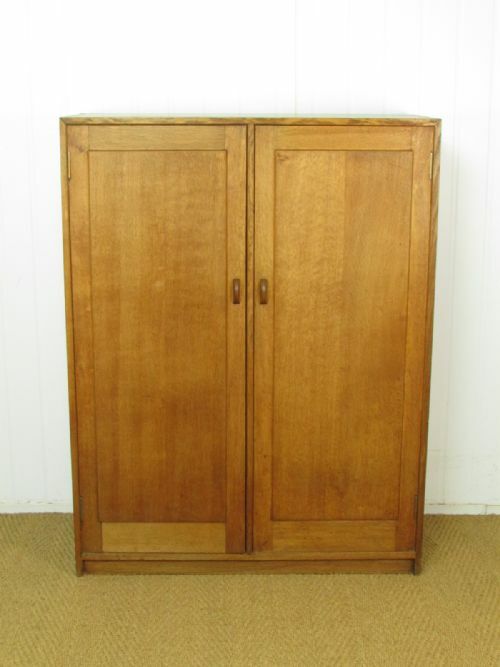 The cupboard is divided into 2 sections by a central divider and each section has two adjustable shelves (4 in total) which are not shown in the images - updated images will follow shortly. 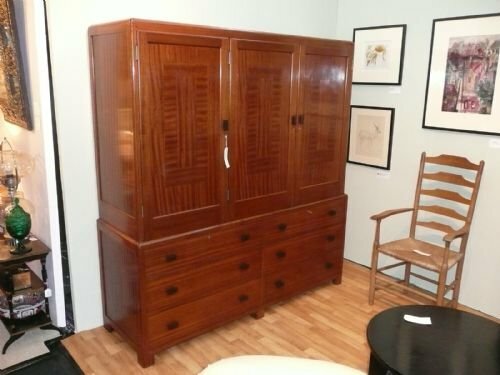 Condition: Offered in very good original condition. 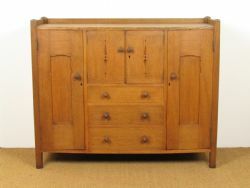 The finish has been cleaned back and revived. 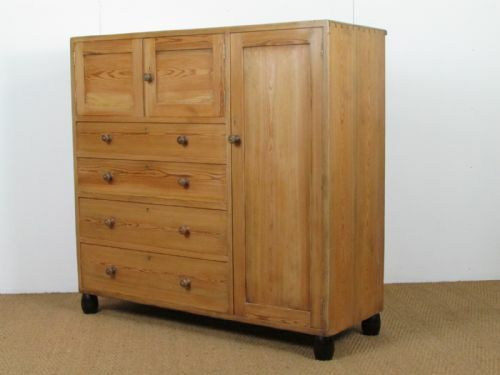 Dimensions: Width 36.25", Depth 15" & Height 47.25"
The cupboard: A stripped pine nursery compactum cupboard with chest by Heal & Son c.1918. 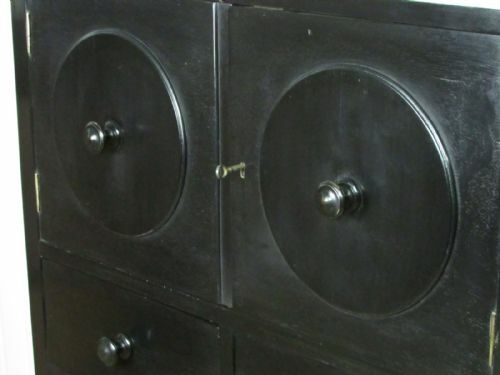 Labelled. 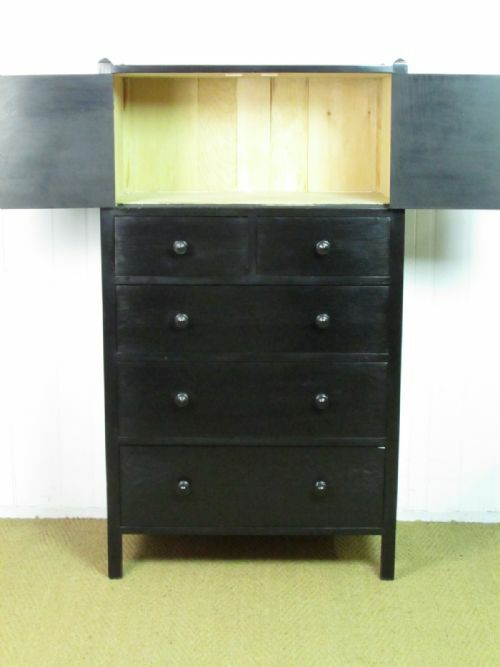 Dimensions: Width 48", Depth 18" and Height 46"